Britain in 1919 is a tumultuous mix of despair and hedonism, a nation cleaned out by the extravagances of the Great War. Returning soldiers, newly-minted revolutionaries and criminal gangs all fight for survival in an industrial landscape gripped by economic upheaval. Thomas Shelby and his family run the most feared and powerful local gang, the Peaky Blinders. Named for their practice of sewing razor blades into the peaks of their caps, they make money from illegal betting, protection and the black market. But Tommy’s ambitions go beyond running the streets, and when a crate of guns goes missing from an arms factory, he recognises an opportunity to move up in the world. As rival gangs, Communist revolutionaries and IRA Fenians descend on Small Heath in pursuit of the weapons; Winston Churchill dispatches a ruthless police chief from Belfast to impose order on an increasingly lawless city and recover the guns. 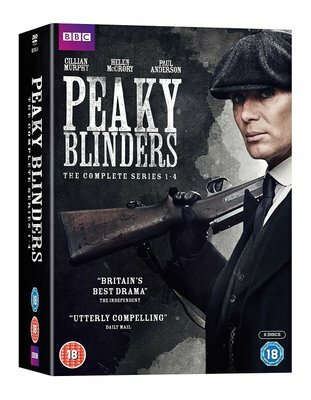 Birmingham crime boss Thomas Shelby heads into perilous territory in the second season of Steven Knight's acclaimed gangster epic. As the 1920s begin to roar, business is booming for the Peaky Blinders gang. Shelby starts to expand his legal and illegal operations. He has his sights set firmly on wider horizons, and the race tracks of the South are calling out for new management. Shelby's meteoric rise brings him into contact with both the upper echelons of society and astonishing new adversaries from London's criminal enterprises. All will test him to the core. Approached by a secret organisation on his own wedding day, Tommy finds himself at the centre of an international arms deal that could change the course of history. In a sphere where no one reveals their true intentions until the game is up, Tommy has to contend with a White Russian exile whose brutality knows no bounds, a priest with a killer dog, a beautiful Duchess even more manipulative than him, and a powerful entity at the heart of the British establishment that will stop at nothing to accomplish its reactionary aims. The pressures they inflict upon Tommy are carefully chosen and exquisitely unpleasant. When Tommy Shelby receives a mysterious letter on Christmas Eve, he realises that his entire family is in danger of annihilation. As the enemy closes in, Tommy flees his country house and heads to the only safe place he knows. Steven Knight’s beloved crime saga makes a triumphant return to the streets of Birmingham in its most sensational and action-packed season yet.